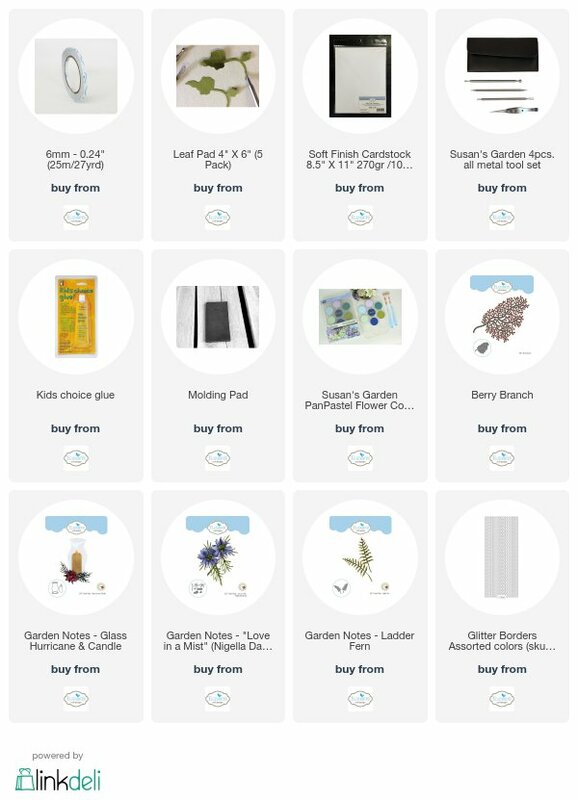 Today is Focus Day for Susan’s Garden new releases. 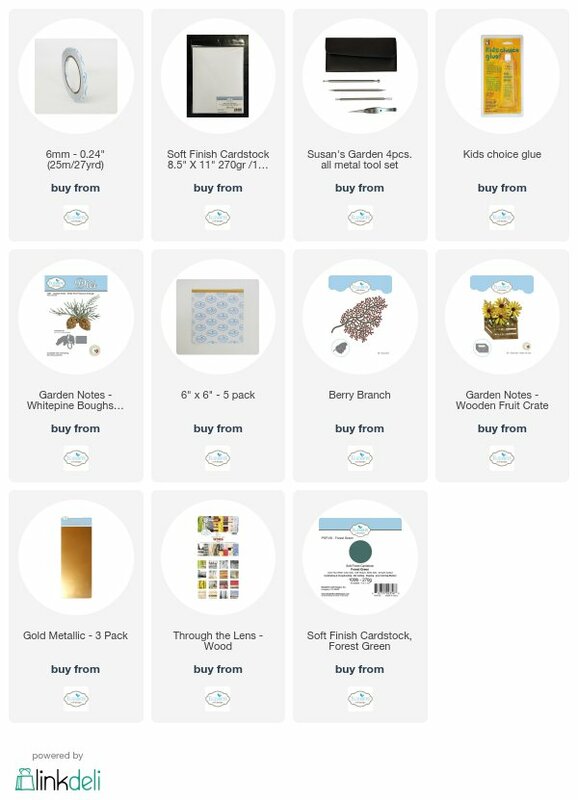 Susan has 8 new dies that have just been released and I have chosen the Gathering Basket which is dear to my heart as I was a basketmaker years ago. 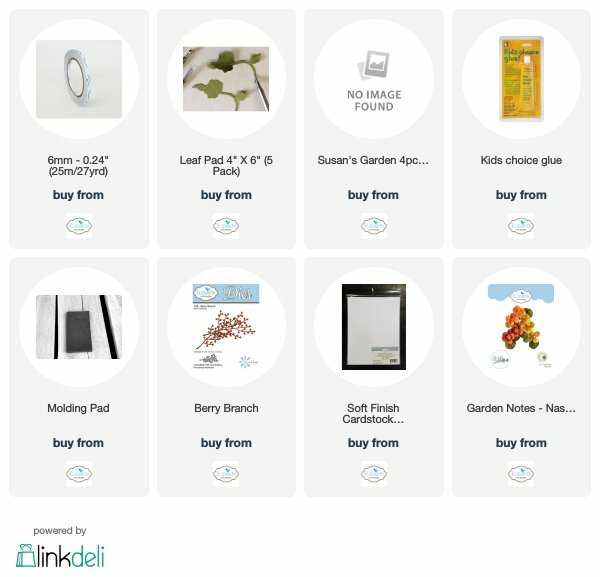 Be sure to visit Elizabeth Craft Designs to see all the great new things and Elizabeth Craft Designs Blog has creations from the design team showcasing the release. 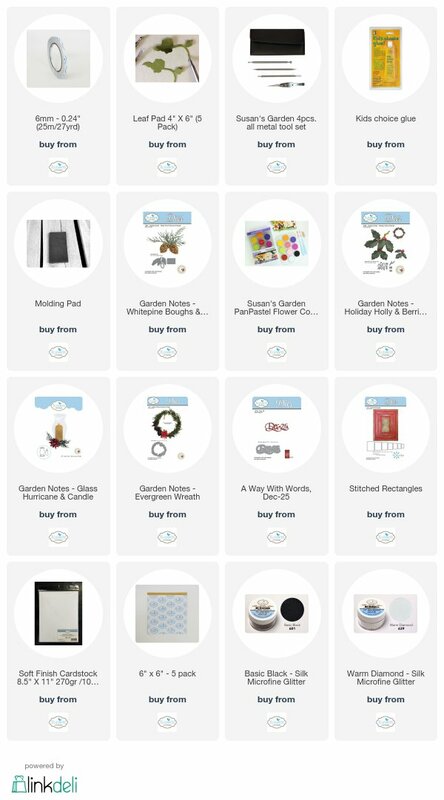 Until next time my Crafty friends – Happy Crafting! Seasons greetings my friends! Today I am posting a card I designed for Susan’s Garden Design Team. You can find a full tutorial on the Elizabeth Craft Designs Blog. 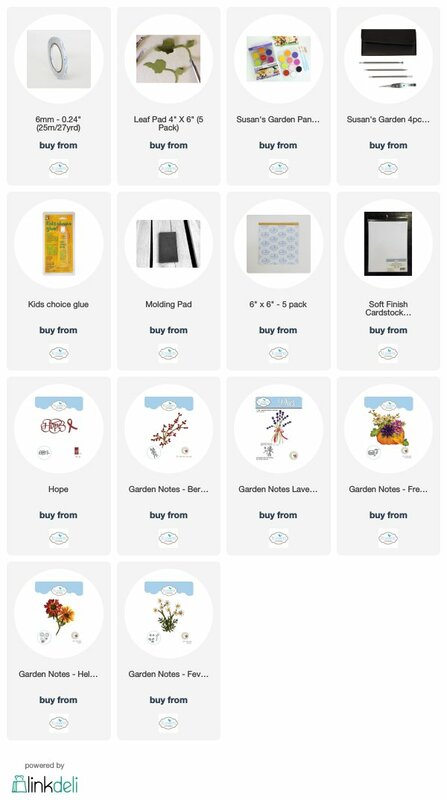 Here are the Elizabeth Craft Design Products you can click on any item to purchase. Welcome to my blog all you crafty friends – thanks for stopping by today. It is time again for another challenge for Susan’s Garden Design Team and this month the challenge is to use red, green and gold in our design so I have chosen to do a Christmas card. My card today is based on what I use for holiday decor around my house and I am a lover of rustic and primitive. This wooden crate filled with pine boughs and red berry branches is what you would find adorning my deck. To enter simply answer the question on the Elizabeth Craft Designs Challenge post. The winners will be announced on Friday, December 13th, on the Elizabeth Craft Designs blog. Cut Forest Green Soft Finish Cardstock 7″ X 11″ score at 5-1/2″ fold on score line. Ink all edges using Pine Needles Distress Ink. Cut red cardstock 6-3/4″ X 5-1/4″ ink edges with Distress Ink color will be whatever red matches your red cardstock. Attach to card front using Clear Double Sided Adhesive. Cut Gold Metallic Shimmer Sheetz 5″ X 6-1/2″ (Note: a little trick to save on your Shimmer Sheetz cut center out of it using a rectangle die or your cutter if you don’t have a rectangle die just make sure that you cut it a little smaller than the white piece of cardstock). Attach to card front using Clear Double Sided Adhesive. Cut White Soft Finish Cardstock 6″ X 4-1/2″ adhere to card front using Clear Double Sided Adhesive. Using Susan’s new Garden Notes Wooden Fruit Crate die cut 1 from brown cardstock and 1 from wood grain patterned paper that has Clear Double Adhesive on the back. (Els Through the Lens – Wood Series used here) Adhere the wood grain crate to brown crate. Using Clear Double Sided Adhesive on only the outer edges of crate attach crate to card front in lower left corner. From brown cardstock cut 3-4 berry branches using Els van de Burgt Berry Branch die. Add red berries to branches using either a red Nuvo Crystal Drops or Red Pearl Pen which is what was used here. I did berries on both sides like Susan does as it make them look so real. Set these aside to dry. Next cut your pine boughs using Susan’s Garden Notes White Pine Boughs and Pinecone set and green cardstock. I cut a bunch of them as I wanted the box full and if any are left you have them for another project. Shade a bit with distress ink then pinch up on needles to give some dimension. Fill your crate with your pine boughs using Kids Choice Glue to attach (I would be careful using too much glue as you need to tuck your berry branches in among the boughs). Once your berry branches are dry add them to crate again using Kids Choice Glue. You will want to cut some of them apart to tuck in smaller areas. Add bow which was made from 1/8″ gold ribbon. Using Suzanne Cannons – A Way With Words – Noel cut 1 from Metallic Gold Shimmer Sheetz using metal adapter plate (this is when you can use piece that was cut from center of your mat) and 1 from black cardstock that has Clear Double Sided Adhesive on back. Adhere the black Noel to gold Noel offsetting ever so slightly. Adhere to card front using Kids Choice Glue. Using white drying glue add to areas that you want to look like a lite snow has fallen then sprinkle Cool Diamond Silk Microfine Glitter over glue tap off excess and let dry. I do hope that you have enjoyed my tutorial today and it has inspired you to go create. Be sure to go to Elizabeth Craft Designs Blog to enter for a chance to win a prize. 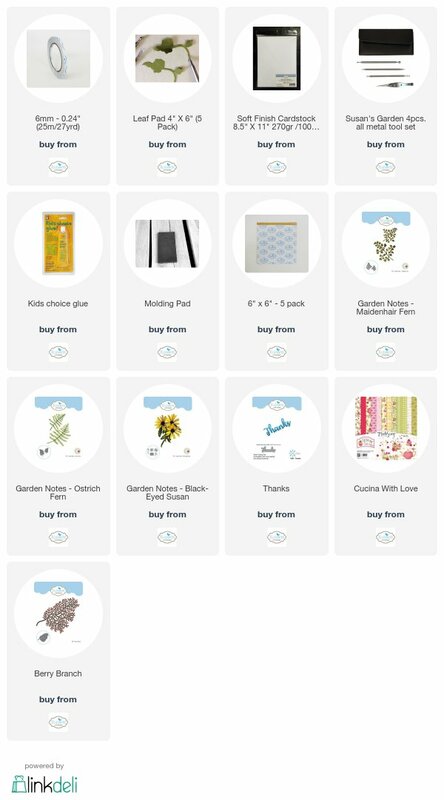 Below are all the Elizabeth Craft Designs products that were used to make this card and they are all linked to the website so just click on them. Hello welcome to my blog thanks for stopping by. Today I am posting a card that was created using some of Susan’s Garden new releases – Glass Hurricane & Candle, Love in the Mist and Ladder Fern. Card base – white Soft Finish Cardstock cut 7″ X 12″ score at 6″ fold on score line. Cut another piece of white Soft Finish Cardstock 5-3/4″ X 6-3/4″. Using Els van de Burgt Studio Stitched Ovals take largest die in set center on cardstock (tape down with temporary tape) die cut. Emboss in a large embossing folder. Cut patterned paper 5-5/8″ X 6-5/8″ adhere to card front using Clear Double Sided Adhesive. (Patterned paper used here was actually a picture I had taken of some old peeling wallpaper then printed on white Soft Finish Cardstock). Adhere cardstock w/oval cutout over patterned paper using Clear Double Sided Adhesive applied just around outer edges. Adhere Black/Silver Glitter Stickers around Edge of Cardstock. From clear cardstock, mylar or clear plastic packaging cut Garden Notes Glass Hurricane (this one was cut from clear packaging as it is heavier). Put a slight been in it. (I used heat gun to warm plastic then immediately held it against a juice glass until cool). Use alcohol marker (I used Copic W7) run it all around edge which will give it a bit of shadow so glass is more visible. Cut candle and flame from off white cardstock color flame with markers then adhere to candle using Kids Choice Glue. Gently pinch candle to give it a bit of a curve. Determine placement of candle and Glass Hurricane within oval (bottom of Glass Hurricane on this card was tucked down behind bottom of oval). Adhere candle using Kids Choice Glue placed on very edge on lower half along with pop dots placed down center back of candle. Next adhere Glass Hurricane, again using Kids Choice Glue just on edges of lower half. From brown cardstock cut two Berry Branches using Els van de Burgt Studio Berry Branch Die. Using white pearl pen add berries to front and back – set aside to dry. From green cardstock cut two sets of ferns using Garden Notes Ladder Fern. Using Distress Ink add some shading. Lay right side up on Leaf Pad take leaf tool from Susan’s Garden Tool Set put vein line in each little leaf. Using Kids Choice Glue Adhere to card front at bottom of oval. Using Garden Notes Love in the Mist cut three flowers from either white Soft Finish Cardstock and color with markers or light blue cardstock shading with PanPastels Set 2. Shape then build onto card using Kids Choice Glue. Cut stamens and leaves from green cardstock shade and shape add stamens to flower centers. Susan has a video on her Facebook page Susan’s Garden Club showing how to create this flower. Once Berry Branches are dry add to card using Kids Choice Glue. Add leaves. I do hope that this tutorial has been inspirational and you will create your own. 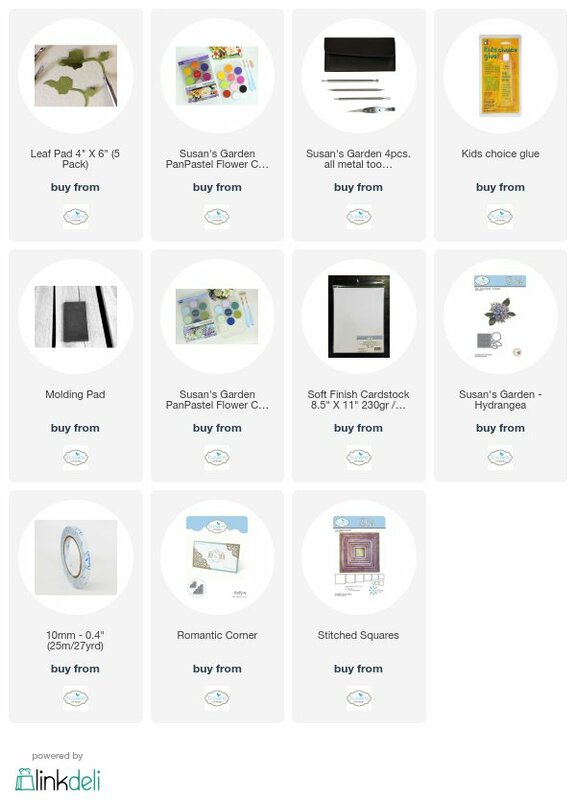 Below you will find all Elizabeth Craft Designs products used and they are all linked to their website just click on any to purchase.